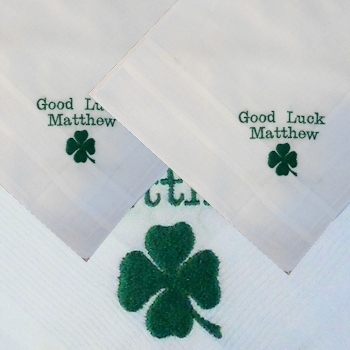 A pair of two cotton handkerchiefs personalised with a name or brief message of your choice and featuring a lucky green four leaf clover embroidery motif. This useful gift set has two green clover embroidered cotton hankies, and personalised with a name, initials or brief message in a thread colour of your choice. Choose from a pair of Ladies size or Mens size handkerchiefs. Choose from a pair of Ladies size or Mens size handkerchiefs. Childrens and Ladies hankies are the same size. Type in the exact text you want personalised and choose the letter font style and thread colour you prefer for the text. Optional gift presentation available of a coordinating organza gift bag, a pop up pillow gift box, or a classic black gift box tied with a ribbon. You may choose to add this to your order with the Presentation options selection. Personalised orders are custom made within approx 48 hours by Amys Gifts.